This hand pull for your axle makes wheel maintenance a breeze. Securely attaches to the inner diameter of your axle to give you a convenient handle that makes the removal and installation of your axle fast and easy. Made of billet aluminum, this trick piece not only looks cool but is extremely handy when it comes time to change a tire. Makes removal of the front axle much easier. Makes it much easier to pull your Axel bolt. I received one that looks more like the rear mount setup but it works just as good... does not look as trick though so I'm a bit disappointed in that, had one on my 2015 FE501 and if you change tires a lot or ever have to fix a tire in the desert these are sooo awesome. Just wish I got what I saw in the photo. Great to have when fixing a flat in the middle of no where. Install these on all my bikes. Makes the task easier. Great product, easy to install (very good directions) and makes field and shop tire swaps much easier... no more rubber mallot banging away to get that axle out! Gonna buy the rear version next. Awesome. Makes those emergency wheel changes at the races a whole lot easier. And they don't really stick out like you would think. Looks stock and works like a champ. What a great idea! I like the fact that this gives you a handle to grab on to. Fits well, really makes it easy to get the axle out. This makes removing your axle a snap by having something to grab onto. In the shop I have all kinds of tools at my disposal to easily get the axle out but on the trail this will be very handy. Installation was easy and it looks nice! <br>I was riding the Hatfield Mccoy trails so maybe it crashed off in some crazy singletrack but it fell out! Too bad because I've been so happy with everything Enduro Engineering. I have not found an Enduro Engineering part that I was unhappy with. So glad RM started carrying these parts. not great as it doesnt clamp on tight enought to get the axel out if axel binds slightly. Easy to install, looks good, works well. Makes taking the wheels off of a KTM much easier. Nice tool for the price. Easy to install and now I can easily pull the axle without having to knock it out with a mallet and a punch. Instillation was a snap, part is sturdy and appears like it will put up with some abuse. Would purchase again and would recommend to a friend. AI put these on all our bikes. Makes changing the tires so much easier. Easy to install and work and look great. Enduro Engineering is the best and so is Rocky Mountain. How does this fit a Yamaha with hex axle end? 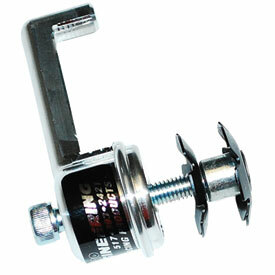 BEST ANSWER: The Yamaha version uses a taper lock design and expands as you tighten the bolt.